A 5S System is a low-cost system that will clean and organize your workplace. It will increase productivity and raise employee morale. This article that will give you some basic information on how to set up a 5S system in your workplace. One of the keys to the success of a 5S system is to have the full support of the management of your company. While a 5S system is low-cost to set up, it will require changes to the work habits of employees and needs the support and reinforcement of management. First you need to educate yourself on 5S. Buy books and do some research online. Write an outline about the 5S system and you will start it in your company. Present your proposal to management for their approval. You may meet resistance since old habits are hard to break. Explain how the 5S system is a useful tool that can improve productivity, promote safety and lower costs. Explain how the 5S system will make the workplace cleaner, safer and more pleasant for the employees. Highlight the low-cost involved to set up and the potential savings of a successful 5S system. Management loves to hear of low-cost ways to save the company money! 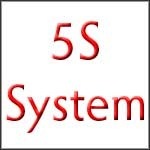 Before you begin a 5S System you must plan for it. This involves walking around the workplace and taking notes. Look at how people work. How far is the work to be done and the tools and parts used to do the work from the workstation? What is laying around that is not used? Are there any obvious work hazards? If so they should be taken care of immediately. Explore every area, ever file cabinet, ever drawer looking for items that do not belong where they are. From these notes you can map out your plan of attack. A 5S system is a team concept. It needs everyone to take part to sustain it. You should pick a core group of people from various workstations to be members of your 5S team. 5S team members should be well-organized and with a good sense for the workflow. While long-term employees are valuable members, someone who has not been around long can add a set of “fresh eyes” to team. Once your team is intact you need to hold a series of planning sessions. As you did with management, the first step with your 5S team will be to educate them on what 5S is and the benefits of it. During these sessions you need to decide how the 5S system will be implemented in your workplace. There is no one size fits all approach, but each step of the 5S system should be implemented, checked and continuously improved. The first three steps, sort, straighten and shine are mainly housekeeping measures. Remember a 5S System is not a one time event. It is a continuous process of improving the workplace. For a 5S System to succeed the first three steps should be part of the daily work routine, usually carried out at the end of each shift or workday. The Sort step should include a plan for both sort events and the daily work habits of employees. Limits on the amount of work in progress should be set so as not to overload a workstation. You will need designated areas where items tagged for removal from a workstation can be taken during a red tag sort event phase. These can be temporary areas near the workstations. In planning for the sort step consider a red tag event will disrupt work. You may need to plan for this event to be done during off work hours. The Straighten step has as its foundation “There should be a place for everything and everything should be in its place”. Your 5S team will need to set up designated areas for everything from parts to cleaning supplies. These areas should be marked and documented. One of the greatest benefits of the straighten step is employees will know where to go to find what they are looking for. The Shine step is all about cleanliness. Decide if more trash and recycling containers are needed and where they should be placed. If you do not have a green workplace plan, a 5S System is a good place to lay the foundation of recycling items such as paper and cardboard. Decide if you have enough cleaning supplies or any tools such as a shop-vac are needed and where they will be stored. These items will be used every day. The Standardize step of the 5S System is about your systems. Examine areas such as how your parts and supplies are received. They should be put in place immediately. Examine your workflow system to see how efficient it is. Parts, tools and work to be done should be close to the workstation. If an employee has to walk 500 feet to get something they routinely use, find a way it can be moved closer. The standardize step can be a framework for an overall process and quality management system. This step should be revisited often to look for areas of improvement. The Sustain step is the last and most important step in the 5S System. No matter how well laid out the plan you must be able to continue it. Continuing the program needs employees to be educated on the benefits of a 5S System and it should be made a requirement of their daily work routine. Old habits are hard to break so checking the system is being following is a requirement. Educational materials for the 5S team and employees. Posters placed around the workplace will remind employees of the 5S System. A bulletin board dedicated to the 5S System. You can post educational material, event notices and location charts of designated areas. Before and after pictures are useful to show how bad things were and how much better they are now. 5S is a team oriented system, allow anyone to offer suggestions on improvements. You will be surprised at what employees can come up with. Plus, no one knows better how the work flows than the ones doing the work. This is useful information for the standardization step. Time permitting several E-books is in the plan. 5S programme will definitely improve the morale of the team and improve the productivity, safety and clean work envinronment. It also help to improve the self discipline. With regards. its absolutetly wonderful to practice 5S.however is there any sample 5S planner and steps to measures? I don’t have anything I could put online, but you may find something on http://elsmar.com/Forums/. They have a lot of good stuff including 5S material. I think that the 5s program is a wonderful idea, but what happens to the emplyees that have hundreds if not thousands of dollars worth of personal tools. it would be cost prohibitive for the company to buy these tools,as well as not in line with the 5s program.